On 18 Sep, Archbishop William Goh spoke at the memorial mass for Fr Guillaume Arotcarena who served in Singapore for 17 years starting from 1982. Fr Arotcarena's stay in Singapore was interrupted mostly because of his alleged involvement in the Marxist Conspiracy. 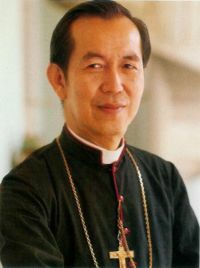 On pg 105, Fr Guillaume Arotcarena wrote,"We also knew that the Archbishop of Singapore (Gregory Yong) would not even try to protect us. We had gone to see him a few months earlier in order to tell him our worries: We had been dismissed. He did not want to get involved." For those familiar with the Marxist Conspiracy, it was often said in the defence of those arrested that they were doing social good, helping the down-trodden and under-privilege without any political or Marxist agenda. The first lesson is that the Church’s social mission is principally a spiritual one. Reading this, it seems that the Archbishop Goh is somewhat disagreeing with the social justice/human rights activist approach (using religious organisation as a platform) used by those involved in 1987. It suggests that the Catholic Church can comment and even criticise but it should not be too active in the politics of social order and it should not overtake the state as the main preserver or reformer of social order. But not all will agree, I am sure. Regardless, the Archbishop's tone of forgiveness and dialogue can only bring us forward and not back. Because dwelling on who's right and wrong, or if they should be an inquiry or an apology, might not mean we are better off as a society. As Archbishop Goh said, "truth and love must go together" - he couldn't have said it better. During a memorial Mass for the late French priest Fr Guillaume Arotcarena, Archbishop William Goh praised him for championing the rights of migrant workers and his compassion towards the poor and marginalised. Paris Foreign Missions priest Fr Arotcarena passed away in France on Sept 3 after a three-year battle with cancer. He was 71. He arrived in Singapore in 1972 and served here for 17 years. In 1980, he founded the Geylang Catholic Centre to provide support and social services to foreign domestic workers, prisoners and drug addicts. The centre closed in 1987 in the wake of the so-called “Marxist conspiracy”, which saw 22 people, including many with connections to the Catholic Church, accused of plotting to overthrow the government under the cover of the Church. They were arrested under the Internal Security Act. In addition, Fr Arotcarena and three other priests were implicated in the so-called “conspiracy”. 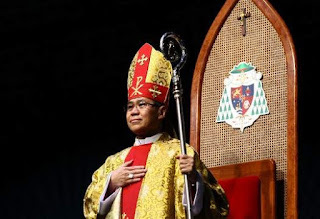 Speaking of the pain the Church experienced during this time, Archbishop Goh acknowledged that those who had served the marginalised, including those who worked with Fr Arotcarena, have “felt misunderstood … hurt, wounded and disappointed”. “We can imagine the pain, the disappointment and even anger, especially against authorities, whether of the state and even of the Church, for apparently not standing up for them,” said Archbishop Goh. He noted that the immediate reaction of anyone who is misjudged is to seek justice, “to uncover the facts” and “to be vindicated”. Noting that the trauma resulting from the so-called “Marxist conspiracy” will “resurface from time to time”, he stressed that there is “no other way forward” for the Church except “the way of forgiveness”. “Only God can judge the motives of each individual,” he said. Archbishop Goh said he believes the painful experience “is not something negative in the Church. I see it as something positive because this event helps the Church to be purified.” There are lessons that the Church can draw from this incident “so that history will not repeat itself”, he said. The Church does not work “simply to save the body,” he stressed. “We want to bring the love of God” to people. The second lesson is that “truth and love must go together”. “All those of us who are serving God … we need to search our motives, we need to purify our motives,” he said. The last lesson Archbishop shared is that the way forward “is always through dialogue”. During the Mass, Fr Patrick Goh, Mr Lawrence Khoo and Mr Vincent Cheng who had known and worked with Fr Arotcarena, shared their memories of him. Holy Family Church parishioner Theresa Chan also remembered how people fondly referred to the French priest as “Fr Tom Jones” as he looked like the American pop singer.